This past summer marked a big change in San Antonio’s transportation landscape when Bird dockless scooters were introduced without consulting city officials. On October 11, 2018, the City of San Antonio approved a pilot program to introduce dockless electric scooters onto city streets to bring alternative forms of transportation to San Antonio. The San Antonio Business Journal reported that, since then, the pilot program has grown to include over 12,000 scooters from six different companies: Bird, Lime, Razor, Blue Duck, Jump and Spin. Most of the scooters are concentrated downtown, but they have slowly spread throughout town. These electric scooters are popular because they offer people a convenient and cheap way to travel. Every scooter has a flat-rate of $1 per ride and an additional 15 cents for every minute of use, or $10 an hour. The scooters can travel up to 15 miles on a single charge and hit a top speed of 15 mph. Since the scooters are electric and dockless, the companies who own them are hiring people to pick up and charge their scooters. The pay can be anywhere between $5 to $20 per scooter. Applying to be a “charger” is as easy as going to the app and registering with the company. New jobs are not the only way the scooters are helping the economy. The San Antonio Business Journal reported that, since the project took off, the city has received over $142,500 in revenue. Residents are split between support and uncertainty. Christina Fonville, a Digital Art student at Palo Alto College, thinks that the benefits of the scooters don’t outweigh the risks that they pose. She believes the focus should be on the bikes for rent downtown, as their carbon footprint is even smaller and there are already regulations in place for bicycles. Since the scooters are new and unlike any of the transportation options we have seen in San Antonio, the non-emergency number 311 has received a lot of calls. Texas Public Radio found that emergency rooms are seeing an increase in patients suffering broken limbs or head trauma after scooters were introduced to the city. In Austin, a 21-year-old foreign exchange student by the name of Mark Sands collided with an Uber driver near Sixth Street on Feb. 1 and died of his injuries. Maribel Vasquez, a Business major at PAC, believes that the scooters are perfectly safe when used correctly. “The only time I felt unsafe was when I would hit a pothole in the sidewalk or moved to one side too quickly,” she said. Since the scooters are dockless, people often have trouble finding proper places to park them once they have finished their ride. This leads to blocked walkways, which can be a problem for pedestrians, especially those who are disabled. Garrett Hill, a Sociology student at PAC who has experience riding the scooters, argued that the issues we are facing are the same ones that we faced in the past with skateboards. 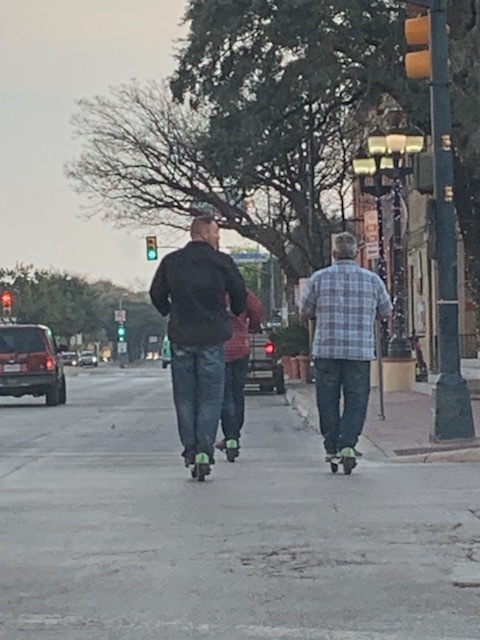 The City of San Antonio website states that the first batch of regulations, which were put in place in October 2018, say scooter riders must always yield to pedestrians, stay out of parks and plazas, stay off the River Walk, use bike lanes when available, and stay at least 2 feet away from pedestrians when using the sidewalk. Riders must be at least 16 years of age, and helmets are encouraged, but not required. After these regulations failed, officials had to come up with more regulations to fix the problems. The most recent regulations implemented a curfew on the scooters from 11 p.m. to 6 a.m. The new regulations allow the city to move scooters that are in prohibited places or are being misused, as well as allow the city to encourage designated parking zones. Contact your council person to voice your opinion on San Antonio’s scooters.